Frederick Auto Body is a family owned, single location body shop located in the heart of downtown Frederick Maryland. We offer the highest quality collision repairs in the Frederick area – we treat each car like it is our own. Our body technicians are highly trained professionals who make sure your car is fixed RIGHT! Our Painters have an average of 25 years painting cars, they know how to match your original color better than anyone in the business. 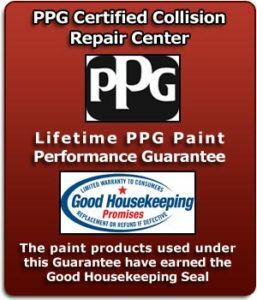 Doing the job right is why we can offer a full 100% lifetime warranty on all paint and body work. But what really sets us apart is our customer service and attention to detail. One call to Frederick Auto Body is all you need to take care of every part of the repair process. From towing, free estimates, arranging rental cars, and negotiating with the insurance company – we handle it all. The owner of the shop is here every day making sure the entire repair process runs as smoothly as possible, if you have any questions or problems he will make sure they are addressed immediately. Frederick Auto Body will repair and/or paint any vehicle, foreign or domestic.